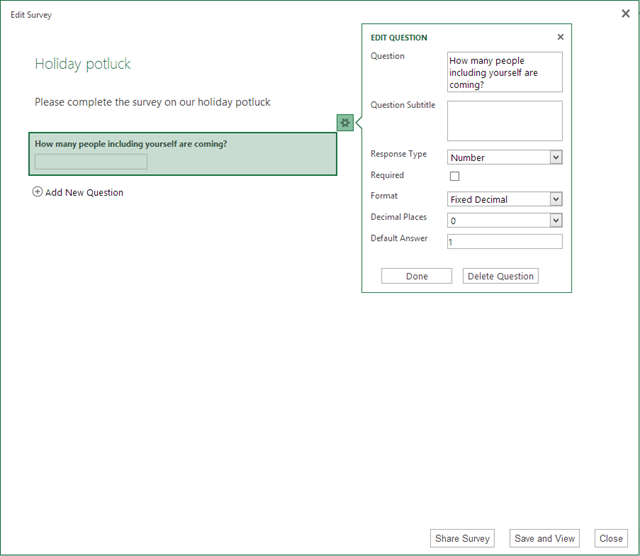 Today we are launching Excel surveys on SkyDrive. Excel surveys are a great way to collect info from your friends and family to better organize and plan activities. 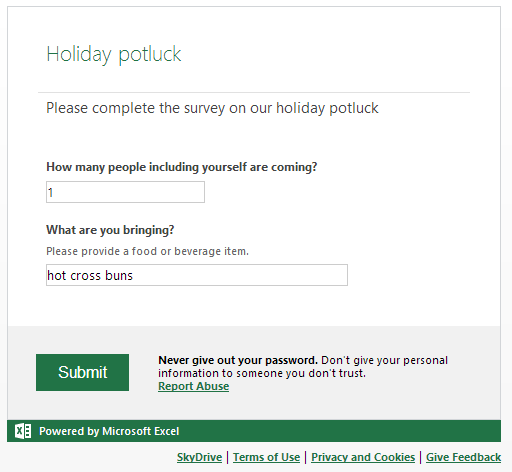 Now, whether you need to plan a carpool, organize a potluck dinner, or get your kickball team together, you can do it right from SkyDrive with an Excel survey. Excel surveys will be rolling out over the next 24 hours in the US, and worldwide in the near future, so if you don’t see them in your SkyDrive yet, you will soon. Creating a survey is really easy. Click the Create button in SkyDrive, and then choose Excel survey. You can then enter in the name of your survey and add questions. Once you’re finished entering your questions, you can share the survey or save it and preview how it will look. 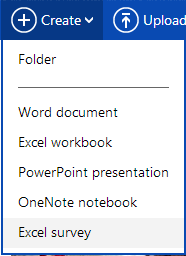 When you go back to your SkyDrive, you’ll see your surveys alongside the rest of your files. 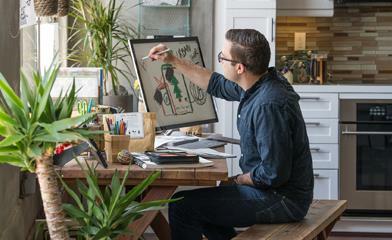 Once you’ve created a survey, you can do all of the things that you’ve come to expect from SkyDrive, like sharing, viewing, and editing. Then when you share the survey, you can shorten the URL and send it to anyone that you want to collect info from. As the creator of the survey, you can view all of the results in Excel and do neat things like embed the results in a webpage, or create and share a chart or pivot table of the results. A survey is a great way to manage an RSVP list for a holiday party, coordinate a vacation with family, or just do some research. We hope you find this feature helpful for the holiday season, and for many years to come! Update: This blog post was updated on Nov. 16 to clarify availability.